On Monday, Dec 15th Burnaby Board of Trade (BBOT) President & CEO Paul Holden was on location at the Corner of North Fraser Way and Tillicum Street, along with Alpha Technologies CMO David Boroevich and TransLink’s VP of Transportation Strategy, Tim Savoie, to celebrate the first day of improved transit in the Big Bend industrial area, following board of trade advocacy efforts and years of petitioning from local businesses. The improved service means changes to TransLink’s route no. 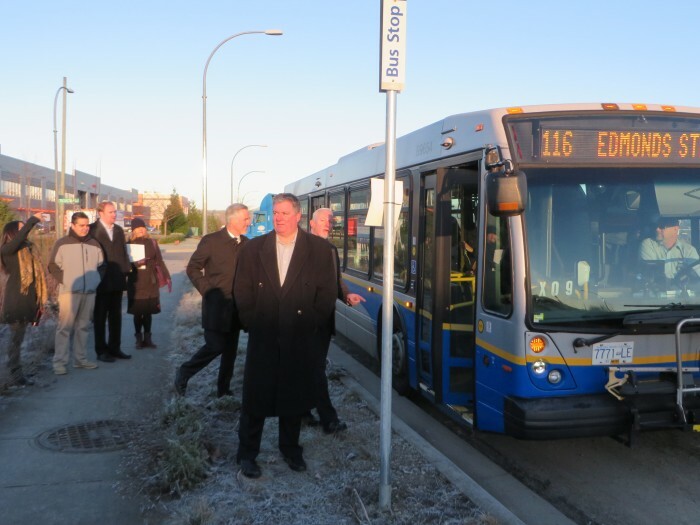 116 to include North Fraser Way, east of Byrne Road, to Marine Way. The changes will add 10 new stops to the route in the area where there is a high demand for service. Importantly, the bus will now stop within walking distance of most business in the Big Bend area. The initiative began to gain momentum last January when the Burnaby Board of Trade and Alpha Technologies co-hosted a Transit Solutions Forum, where businesses were invited to express their concerns and ideas with TransLink representatives in attendance. In mid-September, Burnaby City Council approved the plan to increase service. For a list of other recent Burnaby Board of Trade initiatives, visit bbot.ca/advocacy.